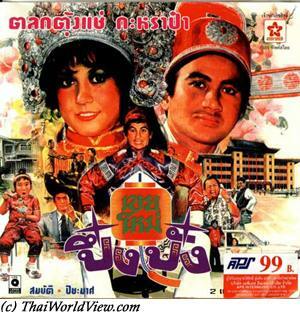 This Runglawan Sripatimakul movie page contains 9 records. 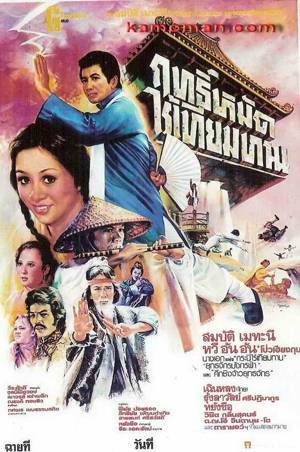 Thai HK movie ฤทธิ์หมัดไร้เทียมทาน / "Writing Kung Fu" / 文打 was released in year 1979 and it lasts 1h20mn. Two versions were released. One for the Hong Kong market with John Cheung. One for the Thai market with Thai actor Sombat Methanee. Thai version is lost. Robbery happens during tea war. John Cheung is playing a teacher for poor children. The teacher is expelled by the ruffians from the city. They always tease him. He cannot support it anymore. Only a little girl follows her. He brings her back to his mother (Runglawan Sripatimakul). Runglawan encourages him to teach children as scholars are needed for the country development. Two men, one blind man and his assistant, seek revenge towards a strong thug (Bolo Yeung) following murders in Vietnam. Money to build the school is stolen. The ruffians’ leader claim scholars are useless. Children better learn Kung Fu than going to school. The strong thug rapes and kills the daughter. Her mother is found dead also. The ruffians’ leader’s sister has to beware of the strong thug as he befriends with her father. The blind and his assistant try to take revenge but they fail. Another beggar also fails but before dying he trains the teacher, who can transform himself from a coward chicken into an eagle. The teacher invents a new Kung Fu with movement simulating writing Chinese characters. Meanwhile the strong thug kills all the ruffians including the leader's sister. The teacher chases after him and defies him. Following a difficult fight, the teacher is about to be defeated but succeeds to give a fatal blow to the strong thug. Before dying, the children tell him a last time that they want to come back with him to study. Kimtom is a young man part of a wealthy Chinese family established in Thailand since a few generations. Wo is a young lady part of a Thai traditional high society family (ผู้ดี). Kimtom and Wo love each other but both families refuse this union. The Chinese family wants a rich bride for Kimtom. The Thai family wants a famous family name to match their rank. The Thai high society family despises Chinese customs (strong accent - พูดไทยไม่ชัด, laugh loudly, No good manners - มารยาท, burping during diner). Kimtom wants to prove that Wo's mother is wrong. Wo's mother is pushing towards the son of a Thai rich family linked to old aristocracy. His name is Samkhan (สำคัญ). Kimtom comes to the diner dressed with Chinese traditional old clothes. As Wo's mother thinks that Chinese food is savorless (รสชืดชืด), she makes a very spicy curry for Kimtom! Kimtom's family makes a 2M Baht donation (บริจาค). Wo's family complains about new rich people (เศรษฐีใหม่) versus old aristocracy (เศรษฐีเก่า). It is Wo turn to go for a diner with the Chinese family. Funny situations happen as she doesn't know how to use chopsticks. Finally both families agree for a wedding but the wedding needs to include Chinese and Thai ceremonies. Kimtom doesn't feel well because Wo's mother doesn't accept him. The movie raises issues regarding multiracial weddings. There should be no border for love. The wife needs to stay in the husband's home according to Chinese customs. But Wo's mother keeps her at her home. Misunderstandings keep happening (ทำประชด). Wo is pregnant. The Chinese family wants a boy first. Then both families fight over the education of the child. Finally as Kimtom helps to prevent a robbery on Wo's mother jewels and they move to their own house, happiness and understanding happen again. 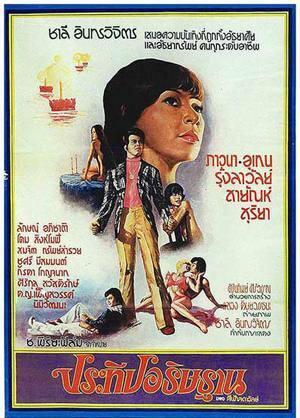 Thai movie ประทีป อธิษฐาน was released in year 1974. It lasts 1h57mn. It was shown on Thai TV cable. Pan (Pawana Chanajit) and Kalan (Uten Boonyong) meet during Loi Krathong. Kalan announces to her that he is her future boss as Hotel manager! Chosri Misommon is Pan's aunt. She always asks for money as she keeps gambling. Pan's mother had a lover as her husband didn't take care of her and her daughter. Upset, the husband wished to bring her to her lover for clarification but a car accident happened on the way and both died. So Pan stayed with her aunt. Sek (Suriya Chinaphan) loves Pan and always does courtship her as a gentleman. Kalan's mother is played by Somjit Sapsamruey. Somjit introduced Da (Runglawan Sripatimakul) to Kalan and wishes for a wedding. The mother believes Pan cannot be trust as cashier as her aunt Chosri is a big spender (การพนัน). Aunt Chosri ends up in jail. While nobody wants to be the guarantor, Kalan offers the money to bail her out. Pan is promoted to manager assistant (ผู้ช่วยผู้จัดการ). Karun (Sayan Chantaraviboon), the second son, is back from overseas but he has heart disease. He likes Pan also. An American tourist is always trying to seduce her also. So four men have hopes on her. Finally she marries Karun. The aunt gets a big amount of money (ใช้หนี้). She knows she doesn't love him. Karun is unable to perform husband duties per a congenital disease. Kalan was former lover of Pan's mother but Kalan confirms it was a platonic love. Smoking scenes and love scenes are blurred. Pushed back by Kalan, Da goes with Lak Apichat to Hua Hin. They become lovers. Karun, being over jealous on Pan, ends up at hospital. Kalan decides to marry with Da to avoid any more jealousy crisis. Unfortunately fightings happen at Kalan's wedding as Karun sees Pan talking to Sek. Pan flees. Kalan announces to Da that he cannot love her as he knows she is pregnant with somebody else (Lak). Kalan finally finds back Pan. Meanwhile Karun is getting crazy and even shoots two people at night believing it was Kalan and Pan. Being a bad girl, Da quits Kalan. Finally Kalan and Pan can have happiness. This is a romantic drama from 1970s with much more realistic story compared to 1960s decade movies.